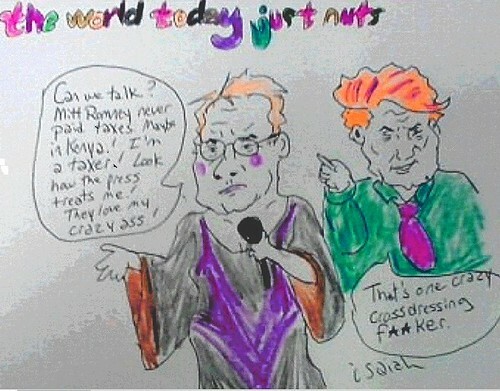 That's Isaiah's The World Today Just Nuts "The Taxer" which I told you about last night. Like "birthers"? Only birthers were savaged by the press. For some reason, Harry Reid acting like a nut with his I-know-something b.s. is considered worthy of coverage. Obama today joined Romney in publicly disagreeing with a controversial ban on gay members of the Boy Scouts of America, one of the nation’s largest and most well-known youth development groups. It’s the first time Obama, who was named honorary president of the Boy Scouts of America in 2009, has publicly taken a position on the issue. Romney first voiced support for gay scouts back in 1994 — a position that his campaign spokeswoman Andrea Saul said remains his position today. So Barack has only now come around to a position that Romney's held since 1994? And this is a fierce advocate for gay rights? That's what Michelle Obama told us. She swore Barack was a fierce advocate for gay rights. What in the world did the left ever do to warrant us getting stuck with Barack? This fauxgressive has done more than enough damage. It is time we bought him a plane ticket to Illinois. You have to wonder how Barack ever fooled anyone to begin with. Yes, that is my clue for "Obama That I Used To Know." Wednesday, August 8, 2012. Chaos and violence continue, a government prosecutor is targeted in Iraq, Nouri betrays the latest agreement, Iraqi politicians worry what Nouri might have of them on tape, the withdrawal-of-confidence vote comes to a halt, and more. The administration didn't want a welcome home parade for the veterans in December of later this year. Some reasons were valid. The country is supposed to be watching the spending and the money Congress had originally allocated for a national parade had actually been spent years ago. Some reasons made no sense at all. The administration claimed that since some Iraq War veterans were in Afghanistan currently, it wouldn't be right to have a parade for Iraq War veterans. When the US finally leaves Afghanistan, what will the excuse be? There will always be -- barring a major shift in foreign policy -- US troops stationed on something other than American soil. The administration also felt the need to pressure NYC Mayor Michael Bloomberg not to hold a parade. What happened instead is that parades have taken place in local communities. St. Louis is where it kicked off. Craig Schneider and Tom Appelbaum got together and organized a parade for the veterans. It was a huge success that spawned many other parades. In July, many people were disappointed, some were outraged. I was outraged (see "The violence and the whores" and "Iraq snapshot") and so was Trina ("Thanks Tom Appelbaum"). Across the country people worked very hard, inspired by the work in St. Louis to do something to acknowledge the veterans. This was individuals working together. And there were plans for future parades later in the year. But the parades worked because they were about the veterans. Tom Appelbaum decided to whore the parade in July (see Trina and my pieces). He turned the St. Louis parade into an advertisement for Barack Obama. The ridiculous commercial credited Barack with the parade. Barack didn't donate an hour of organizing or a dime from his bank account. Nor did he attend the parade. The parade was about the veterans and Tom Applebaum didn't (my opinion) have enough respect for the veterans to refuse to whore for the Obama campagin. The parade had nothing to do with Democrats or Republicans or any label other than "veteran." Craig Schneider co-organized the parade. He did not take part in the Obama campaign commercial. He has penned a column for the St. Louis Post-Dispatch entitled "People, not politics." It is an intelligent and deeply felt column. Please use the link to read the entire column. Here is an excerpt. The news was personally upsetting for two reasons. First because its message is in clear contradiction of the apolitical nature of the 501(c)3 organization that grew from the January event, upon which the two volunteers sat. The organization has asked for their resignation. But the bigger concern about the ad stems from how upside down it seemed to turn the very nature of the movement that began in St. Louis and has since spread to more than 20 cities. All around the country this year, a loose and unpaid coalition of volunteers from all sectors has come together in the universal understanding summarized by the motto of this grass-roots movement: Those who did and still serve are people. They aren't politics. Since the beginning of the post-9/11 age of combat, one of our greatest failures as a society has been the emotional distance we've allowed ourselves to keep between our wars and the people we send to fight them. We've placed the enormous burden of 10 years of multi-front warfare onto less than 2 percent of our population, forcing men and women to leave home and go risk death not once, but two or three or four times. Or more. While our sons and daughters have died, taken bullets and bombs for us and returned from multiple trips to hell with wounds both inside and out, the other 98 percent of us back here have bickered over "the troops" as if they were some abstract thing. They are not. They are people. They are us. Again, it is a very important column. Craig Schneider works to put veterans first. In the Congress, the Senate Veterans Affairs Committee is an example where party label is not an issue of great importance and Democrats and Republicans who might not work together on any other issue find a way to come together over what's in the best interests of veterans. Though all members of the Committee reach out to one another (including Senator Bernie Sanders who is neither a Democrat or a Republican), the largest credit for that has to go to Chair Patty Murray and Ranking Member Richard Burr who set such a strong example and such high standards. Without that example and that desire to work together, this week's victory would not have taken place. As Kat noted last night in "Camp Lejeune (justice finally)," the victims of Camp Lejeune finally got recognized with President Barack Obama signing into law the Honoring America's Veterans and Caring for Camp Lejeune Families Act of 2012. This is an issue that Senator Burr has worked years on. Chair Murray said it would get a floor vote and it did. She said it would be signed this summer and it was. (Washington, D.C.) -- Tomorrow, Thursday, August 9th, 2012, U.S. Senator Patty Murray, Chairman of the Senate Veterans' Affairs Committee, joins Secretary of Veteran Affairs Eric Shinseki at the Port of Seattle for a press conference on veterans jobs. Senator Murray will highlight a bill she is sponsoring in the Senate, the Veterans Jobs Corps bill. Senator Murray's bill is modeled of successful job training programs across the country and in states like Washington. The Veterans Jobs Corps bill would build on the gains already made with Senator Murray's VOW to Hire Heroes Act, and serves as a $1 billion investment in veterans and their capacity to strengthen America. Over the next five years, the Veterans Jobs Corps would: increase training and hiring opportunities for all veterans; help restore and protect national, state, and tribal forests, parks, coastal areas, wildlife refuges, and cemeteries. It will also help hire qualified veterans as police, firefighters, and first responders at a time when 85 percent of law enforcement agencies were forced to reduce their budget in the past year. Senator Murray will point out that this bill contains bipartisan ideas, is fully paid for with bipartisan spending offsets, and should not be controversial at a time when veterans continue to struggle. The Port of Seattle was recently recognized with The Freedom Award, the Department of Defense's highest recognition given to employers for exceptional support of our Guard and Reserve members. Tomorrow the high for the day in Baghdad is supposed to be 45 degrees Celsius (113 degrees Fahrenheit). And as if Iraq didn't have enough hot air of late, two government spokespeople try to add to it. Mohammad al-Qaisi (al-Shorfa) reports that Ministry of the Interior spokespersons Hikmat Mahmoud al-Masari and Adel Dahham see al Qaeda in Iraq 'imploding' and they know -- in their heart of hearts, they really, really know -- this is happening due to events like last month when they discovered the bodies of two leaders in one house -- both were dead! The events of today have already slapped them across the face. But, since thinking caps appear to be in short supply at the Ministry of the Interior, let's provide them the walk through that they're too dumb to see. Whether it's a mafia movie or a vampire movie, when the 'bad guys' start turning up dead, that generally means that something even more violent and destructive has decided to move in and take over. So rejoicing over those two dead leaders? The Ministry of the Interior would be better off grasping something more powerful than those two leaders is now what they will be up against. July 22nd, the Islamic State of Iraq released an audio recording announcing a new campaign of violence entitled Breaking The Walls which would include prison breaks and killing "judges and investigators and their guards." The last weeks have demonstrated that ISI is serious about pursuing those goals. Their determination is also clear with an attack on a government prosecutor this morning. KUNA reports unknown assailants invaded a Baiji home (Salahuddin Province) and killed 8 members of one family. Kitabat adds that a government prosecutor lived in the house and that one of the sons was also an attorney. In addition, they note that the attack took place at five in the morning and that there was some effort to burn the corpses after. Alsumaria quotes a police source stating that the assailants stormed the home, firing automatic weapons as they did, killing the government prosecutor, his father, his sisters and brothers and a family member that hasn't been identified so far. Xinhua identifies the prosecutor as Adnan Khayrallah and they note, "The attackers shot dead Adana, his father, three women, two children along with a guest, the source said without giving further details." The Hong Kong Standard spells the name of the prosecutor as "Khayrallah Shati" and says he and his wife, their five sons and an unidentified 8th relative were killed. The big story in Iraq today is a fear of political violence. What would you do if you held public office in a fundamentalist nation and, privately, you did a few things you'd like to keep hidden? And what would you do if you then found out that those private moments had been taped? All Iraq News notes that someone has released a fuzzy (audio and video) taped meeting from last year between Vice President Tareq al-Hashemi and Iraqiya leader Ayad Allawi following Allawi's meeting with Grand Ayatollah Ali al-Sistani. Iraqiya is calling for an investigation into where the tape originated and who released it. As the rumors swirl, Alsumaria notes, Speaker of Parliament Osama al-Nujafi has declared that the move towards questioning Nouri before Parliament has now come to a halt. The United Nations spying row widened on Friday when former weapons inspector Hans Blix revealed he suspected his UN office and his home in New York were bugged in the run-up to the Iraq war. Dr Blix said he expected to be bugged by the Iraqis, but to be spied on by the US was a different matter. He described such behaviour as disgusting, adding: "It feels like an intrusion into your integrity in a situation when you are actually on the same side." He said he went to extraordinary lengths to protect his office and home, having a UN counter-surveillance team sweep both for bugs. "If you had something sensitive to talk about, you would go out into the restaurant or out into the streets," he said. Dr Blix's fears were reinforced when he was shown photographs by a senior member of the Bush Administration that, he insists, could only have been obtained through underhand means. His accusations came after former British cabinet minster, Clare Short said US-British intelligence bugged the office of the United Nations Secretary-General Kofi Annan. Probably not a good idea for the US to be without a US Ambassador to Iraq currently. Would the US tape Iraqi politicians and turn the goods over to their pet Nouri to allow him to blackmail other politicians? Both the Bush administration and the Barack administration spent their waking hours with activities that ensured people would be ready to believe such a rumor. The US-brokered an agreement recently. Remember? It was going to lower tensions between the Iraqi military and the Peshmerga (KRG force). That was Monday. AKnews reports today that the agreement has yet to be signed. In what the Kurds will most likely see as a huge betrayal of this new agreement, AKnews reports, "A force from the Iraqi army has been stationed at the borders of Saadiya, Diyala province, said a chief of Kurdistan Democratic Party (KDP) in Saadiya. The force from the 20th Army Brigade which was stationed in Meqdadiya before has been moved to Saadiya on the pretext that the security of Saadiya is deteriorating, said Hassan Abdul-Rahman, KDP chief of Khabat neighborhood in Saadiya." 'Security' Nouri style. Blackwater once provided 'security' (terrorized the Iraqis) in Iraq. They went on to become Xe and now Academi. Like many a shady person, they employ mulitple aliases. Joseph Neff and Jay Price (McClatchy Newspapers) report on how the US government has again betrayed the people: "The military contractor formerly known as Blackwater ended a long-running criminal investigation Tuesday by admitting to lawbreaking that ranged from possessing illegal machine guns at its Camden County, N.C., training grounds to attempting to land $15 billion in oil and defense contracts in southern Sudan while U.S. companies were barred from doing business there." They broke the laws and all the multi-billion dollar business has to do is pay a measly fine of $7.5 million dollars. They hurt Iraqis and no one will do jail time for this offense or any other. Meanwhile the same administration that overseas letting Blackwater off scott free is the administration that wants to lock Bradley Manning away forever. Bradley's court-martial was scheduled to begin September 21st. Monday April 5, 2010, WikiLeaks released US military video of a July 12, 2007 assault in Iraq. 12 people were killed in the assault including two Reuters journalists Namie Noor-Eldeen and Saeed Chmagh. Monday June 7, 2010, the US military announced that they had arrested Bradley Manning and he stood accused of being the leaker of the video. Leila Fadel (Washington Post) reported in August 2010 that Manning had been charged -- "two charges under the Uniform Code of Military Justice. The first encompasses four counts of violating Army regulations by transferring classified information to his personal computer between November and May and adding unauthorized software to a classified computer system. The second comprises eight counts of violating federal laws governing the handling of classified information." In March, 2011, David S. Cloud (Los Angeles Times) reported that the military has added 22 additional counts to the charges including one that could be seen as "aiding the enemy" which could result in the death penalty if convicted. The Article 32 hearing took place in December. At the start of this year, there was an Article 32 hearing and, February 3rd, it was announced that the government would be moving forward with a court-martial. Bradley has yet to enter a plea and has neither affirmed that he is the leaker nor denied it. On this week's Out-FM (Tuesday nights, seven p.m. EST, WBAI), John Riley and Bob Lederer covered Bradley by speaking with two reporters covering the case. Bob Lederer: This is Bob Lederer with John Riley reporting for WBAI 99.5 FM and we're here at Fort Meade, Maryland. And today we've just finished the 6th pre-trial hearing in the court-martial of accused whistle blower Bradley Manning -- the openly gay Army intelligence analyst who is facing 22 charges stemming from his alleged disclosure of nearly 3/4 of a million documents and videos to WikiLeaks. Some of these materials show evidence of War Crimes and other inappropriate conduct by the US government and its allies. The pre-trial hearings have been presided over by military Judge Denise Lynd. The actual court-martial trial over which she will also preside is not expected to begin until some time next year. This is part two of Bob Lederer and John Riley's reporting. We noted the first part in the August 1st snapshot. Marcia pointed out that night that she was suprised (and angry) to learn that the court-martial was being postponed. Apparently, to allow Barack to look his best before the election, the court-martial of a whistle blower must take place after America votes. Bradley's already been imprisoned for over 800 days. Bob Lederer: Another ruling by the judge had to do with the next pre-trial hearing scheduled for August 27th through 31st at which Bradley Manning's lawyer will argue that Manning who has been held now in pre-trial detention for upwards of two years was subjected to eight months of illegal treatment in solitary confinement at the Marine Brig in Quantico, Virginia. Kevin, can you summarize what that treatment was? What witnesses and physical evidence his attorney moved to be require be provided during the upcoming hearing? And what the judge ruled on this issue? Kevin Gostola: So the defense reported this in December 2010. And he said, on his blog, he keeps a blog, and he updated everyone on the fact that Bradley Manning was in solitary confinement for 23 hours a day which is something that the government says he wasn't in solitary confinement. That's just not what they call it. He talked about how Bradley Manning was under confinement conditions that stemmed from something that the Marines or the military calls "prevention of injury watch." Or suicide risk. So a detainee can be placed under this restriction and that means that he's a maximum custody prisoner or it's believed that he could endanger himself. So they do these things to him that could be considered onerous or inhumane basically. And one of these things has to do with having to wear a smock. So in some instances he was stripped naked because he said something that a commanding officer did not like and the commanding officer. A military police officer, John Riley explained, then interrupted the interview. "This is freedom of the press at Fort Meade," declares Kevin Gostola. Today, Rob Kall (OpEdNews) interviewed Dr. Jill Stein and, among the topics they discussed was, her recent arrest. Excerpt. Rob Kall: Now from my understanding is that you came to Pennsylvania, went to Harrisburg. You were involved in getting things finalized and then you got yourself arrested. Jill Stein: That's right. For the first time in my life, I have to say. Jill Stein: That's right. I'm now a member of a very big club. Yeah. Rob Kall: Well what happened? Jill Stein: We -- You know we have a very strong network in Pennyslvania that Cherie Honkala is very much connected with. And this is the Poor People's Economic Network. And they and Cherie and the Green Party have been fighting the foreclosure crisis that is just raging in Philadelphia and other places around the country. So we have been long supporting two women and their families that have been trying to hold onto their homes and are basically in the foreclosure process thanks to Fannie Mae which we as tax payers basically own. They continue to throw families out of their homes. And these two women in particular had very unjust cases against them. One had inherited the house from her mother. Yet when her mother died, the bank put it into foreclosure and refused to deal with her. She's a working woman. She lives in the house. She has the ability to absorb the mortgage which, by the way was a reverse mortgage in order to take of the mother's health problems in her final years. Another example of what's broken -- our health car system. And we're having to put our homes into hock in order to afford health care in this unjust health care system. And we're having to put our homes into hock in order to afford health care in this unjust health care system. And then people are getting thrown out of their homes because the banks are looking to do that, looking for every excuse they can get to take possession of a home which is completely unjust and, you know, illegal. Every legal means has been pursued including efforts to change these laws and nothing has been forthcoming. So we went into Fannie Mae, along with a large group of supporters, had a demonstration outside on behalf of these two home owners. And we basically went into Fannie Mae to ask them to please sit down, to bargain in good faith to keep these home owners in their homes. And they offered to basically buy them off for a small fee. They offered them $2,000 if they would just go away bit did not offer really to negoiate and revise their morgates agreements and enable them to -- recognize them as owners of their homes and allow them to stay. So we all sat down until such a time as they would do this and five of us were arrested -- basically for trespassing. Rob Kall: Had you thought ahead and planned to do this? Was this a decision that you made ahead of time? Jill Stein: Well we made the decision that we were going to go to the mat for these home owners and that we were going to do everything in our power to make the banks do what they're supposed to do -- which is negoiate to keep home owners in their homes. That's why we bailed them out -- you know, to the tune of some four-and-a-half-trillion dollars in bailouts. Plus another 16 trillion in free loans. You know that was in order to keep home owners in their homes and protect our communities from the devestation of foreclosure which is not just a problem for the home owner. It's really a problem for the whole community. And it beomes really a blight of vacant buildings which is a real problem, brings down everybody's home. In November, elections will be held in the United States. Among the offices up for a vote? The White House. Jill Stein is the Green Party's presidential candidate. Yana Kunichoff (Truthout) interviewed Stein yesterday. Excerpt. JS: It's about bringing the fight that's going on at the grassroots level, for our homes, for jobs, for affordable healthcare, to have tuitions that a student can afford. These fights are actively going on in our communities, but they are not currently represented in electoral politics. They are not on the horizon of two major parties, they are busy talking about Mitt Romney's tax forms or latest gaffes, anything but the real problems that Americans are struggling with and how we are going to fix them. Bringing the grassroots struggle into electoral politics and challenging the hijack of our electoral system and Wall Street gives me the liberty to talk about what we need and how we are going to fix these things. We need a green economy if we are going to survive. The public is aware that we need to bring the troops home now. It's so exciting to me that there is a kind of real focusing now of the public voice, and the public mindset, and to my mind it's very exciting to be able to provide a political vehicle for that consensus that has begun to really come into focus. JS: I think it's pretty clear from polls across the country that there is a rapidly declining interest in the Democrats. The approval of Congress is in the single digits. It's no secret that people are not happy with what the two political parties are proposing. We launched our campaign at a middle of the road university in Illinois [Western Illinois University]. I was asked to come by a woman who was my campaign manager on campus and asked me to come on election night. So I thought it over and called her back and said 'Sure,' because young people are what our campaign is all about, the only campaign that is actually addressing the crisis that young people are facing. Of course we are going to come, we are going to kick off our campaign at your college. I had six minutes to explain to a group that had never voted green or lefty or independent. He withdrew from Iraq, yes, but on Bush's timetable; he escalated the war in Afghanistan; he spent a billion dollars intervening in Libya; he continued the "extraordinary rendition" program; and failed not only to close the prison at Guantanamo Bay, but even to prosecute its inmates in our civilian federal courts. Domestically, I don't even want to discuss Obamacare, which is not national health insurance by any stretch of the imagination, but we must. I still find it surreal that the Democrats, controlling the White House and both houses of Congress, failed to institute national health insurance, partly because the administration, and the party's recent vice-presidential nominee (Joseph Lieberman), bowed to the insurance lobby. On the energy front, the U.S. has not even begun a serious transition to alternatives to carbon fuels. And, somehow, the Democrats have become a party that supports capital punishment, despite massive evidence that it has failed miserably and is applied in a racist manner. Economically, the president extended the Bush-Paulson bailouts and acquiesced in renewal of the Bush tax cuts, despite repeated vows to the contrary. As for social spending, I expect the Republicans to advocate cuts in Medicare and Social Security, but I'm still trying to figure out how the Democrats can, with a straight face, do the same. Furthermore, in a policy that boggles the mind, Obama brags about having cut the payroll tax, the primary source of funding for Social Security. The Green Party is on the other side of all those issues, foreign and domestic. I don't agree with everything the Greens advocate, but on the issues that I consider most significant for America's future, the Greens are on the right track. The Advocate's "Person of the Year" in 1994 and included in its "Heroes" list for successfully fighting producers and network executives to include some of television's first realistic portrayals of gay characters. She has two siblings who are gay and who have long been in relationships. Barr's sister and partner have been together for 25 years and have twin daughters. Her brother and partner of 26 years have grandchildren. "They deserve every ounce of equality with any other Americans," Barr told The Advocate. "They are wonderful, productive human beings, and are the reason I am such an activist for LGBT issues and always will be." Always the comedian, she added, "I just wish one of my relationships had lasted as long as theirs!" Among the key points in her platform, Barr says she wants to cut back on military spending and bases abroad, bring troops home, create a financial-transaction tax, crack down on corporate outsourcing of jobs overseas, and remove caps on taxes for the rich. She also wants to create a single-payer health-care system and legalize marijuana. She believes prison time should be reserved for violent criminals—with the exception of the Wall Street bankers who have "defrauded the working class and middle class," she says. "Those people should be in jail." She thinks her history as a comedian works in her favor, not against. "In order to be able to write a good joke, you have to find the truth," she says. "I've spent 30 years as a comedian focused on working-class issues. Working-class people do not have a vote in this country. That's the real reason why I'm running and why I've put up my own money to seek ballot access in all 50 states. I will keep running till I win." Barr says the government is "not supposed to be run like a business" and is "supposed to protect people from fat cats." She adds, "They had the big bubble that they created. If you watched cable TV, you just saw all the time: 'Time for a second mortgage!' That was a scam, just theft." She calls the battle between Republicans and Democrats a choice between "Satan and Satan."